Sadiq Khan, Hilary Benn and Yvette Cooper are among the senior Labour figures with sufficient popularity and public recognition to mount a credible challenge in a future leadership election, according to new research. The London mayor and two former shadow cabinet heavyweights came out slightly ahead of Andy Burnham in a poll which married together Labour politicians’ “likeability” with public awareness. 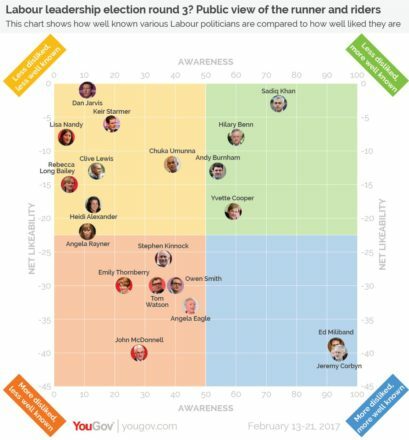 The study, carried out by YouGov for The Times‘ Red Box email, also showed Dan Jarvis ahead of them all on popularity ratings although he lacks the public profile of Khan, Benn, Cooper and Burnham, who all served in the cabinet in the last Labour government. Burnham, MP for Leigh, recently left the top team to run as a metro mayor candidate in Greater Manchester. Jeremy Corbyn was awarded the worst public rating for likeability for Labour politicians – although he has won two landslide wins to take the leadership. The research was prepared in the run-up to the two year anniversary since Labour lost the general election. It appears highly unlikely there will be a leadership contest this year – following two in the past two summers – regardless of the outcome of today’s by-elections because Corbyn’s mandate is strongly established. Labour has faced repeated speculation that Corbyn could stand down before 2020 although he has denied the suggestion he would retire and trigger a fresh contest. “On this evidence, the candidate who would make the greatest impact as leader might be Sadiq Khan,” wrote Chris Curtis, international politics research executive at YouGov. Jarvis, a former paratrooper elected to the Commons in 2010, also emerges as capable of winning strong support in a future because he scored best on the “likeability” measure. While the Barnsley Central MP lacks the public profile of some of his colleagues, the researchers point out that Corbyn himself came from a low profile to storm to success in the 2015 leadership contest.